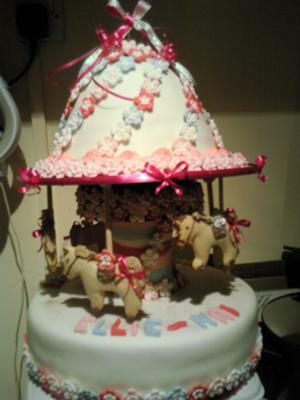 To make this carousel cake, I made a 12" vanilla cake for the bottom, vanilla buttercream and strawberry jam and covered it in ivory fondant. The center column is a tin of tomatoes covered with fondant paste. The top cake was baked in a tin used for the skirt of a princess cake this is a chocolate cake also covered with ivory fondant, the flowers were home made and the top also go's around with the aid of a turntable. That is very cool! I really like it! Good job!